One thing is for certain: every time we visit Ottawa, we have to make a stop in at IKEA. I’m not a big fan of shopping, but I could spend all day in IKEA looking around. I love checking out the room displays in the showroom and then filling my cart with items from the marketplace. There is truly something for everyone at IKEA Canada. 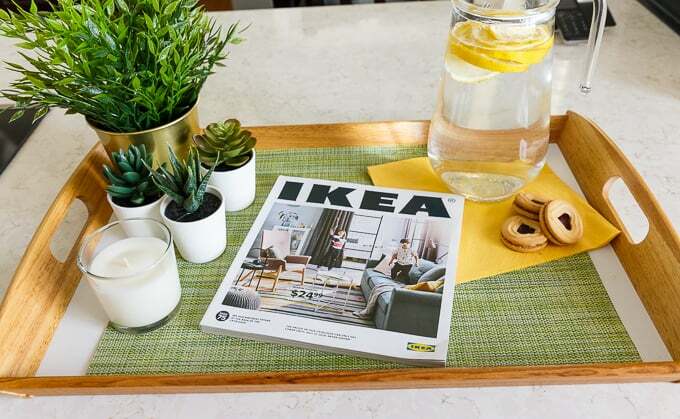 The IKEA 2019 Catalogue is now available in stores and is also hitting mailboxes across Canada this month. My mom and I were planning a trip to IKEA so I was browsing the catalogue making a list of my must-buy items. It’s filled with amazing new products along with an insert that highlights new lower prices on some old favourites and great deals for their 75th anniversary. You really need to check it out! You’ll be able to order a printed copy online starting on September 1st. I made a list of products I wanted to check out on our IKEA shopping trip. I was shopping for kitchen and home decor items for myself as well as items that Olivia, my oldest daughter, could use at university this year. What’s great about IKEA is that there is something for everyone. It’s the kind of store with a broad appeal which is one of the reasons why I love it so much. It’s one-stop shopping. For me, I appreciate the versatility. You can buy products and use them in a variety of ways. For example, I found the KLACK tray in the catalogue and wanted to pick one up. I could use it in a couple different ways. The first way to use it is a home decor piece. IKEA is filled with wonderful items to decorate your home. I love the FEJKA artificial plants because I have a black thumb. However, IKEA also carries real plants if that’s more your style. This set-up is perfect for a coffee table. Along with the FEJKA plants, I added a SINNLIG candle, KAFFEREP cookies, FANTASTISK napkins, a jug of lemon water and the IKEA 2019 catalogue. 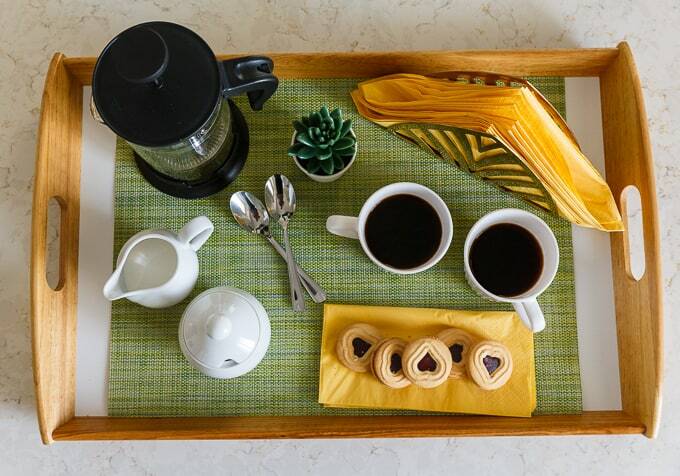 Another way you can use the KLACK tray is for a breakfast in bed! Or in my case, coffee in bed since I’m not a big breakfast eater. I spent A LOT of time in the kitchen area of IKEA (my favourite part of the store!). 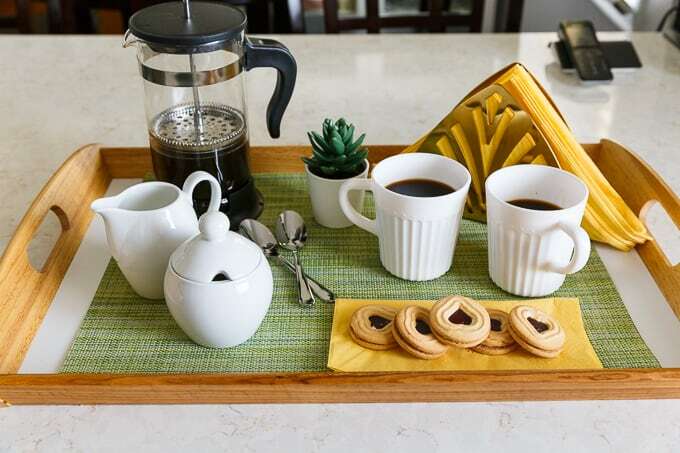 I found a coffee press, cream and sugar dishes, coffee mugs and a pretty napkin holder. 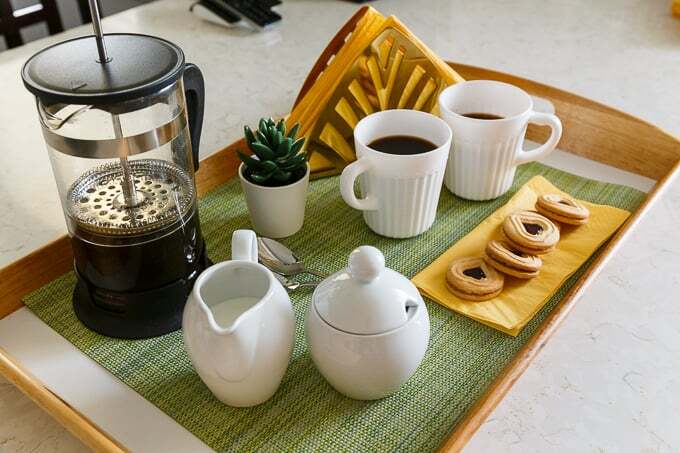 What a beautiful way to serve coffee when you have guests over! As you can see this versatile tray can be used both in the kitchen and on your coffee table as a decor piece. 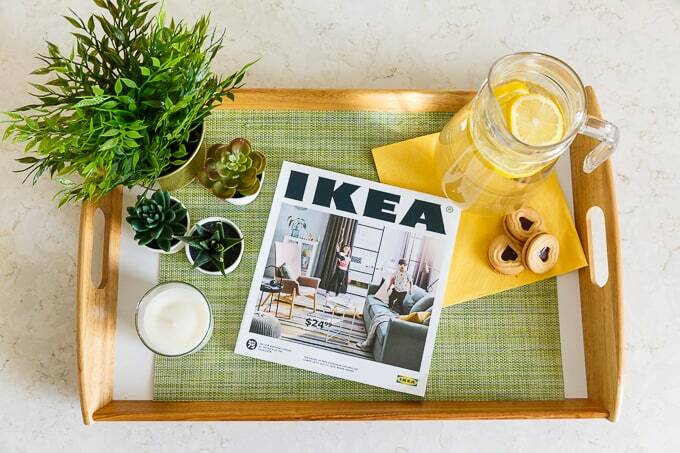 Have you checked out the IKEA 2019 catalogue yet? Ikea is my favorite, they really do have something for every style!